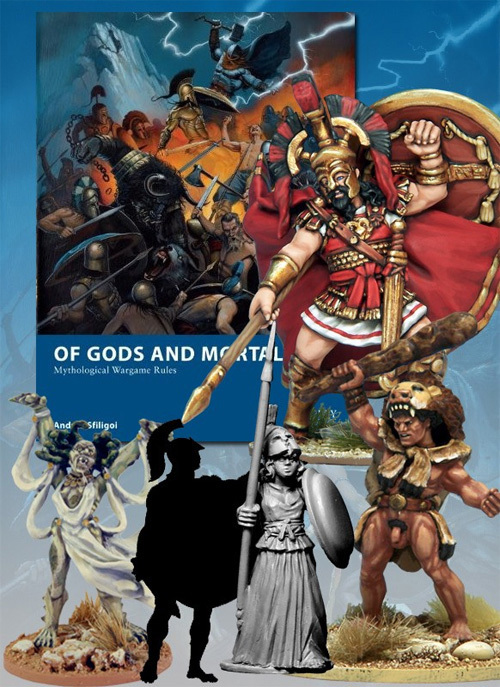 The Greeks have an extremely varied array of troops from which to choose, and the various gods and legends are very diverse. A lot of different armies can be created just by changing a few figures. You have powerhouses like Zeus or Ares, shooty gods like Artemis, or deities with hidden aces like Dionysios, Hades or Poseidon. And you can also surprise the opponent with lesser-played gods such as Aphrodite or the speedster god Hermes. However, players are always asking for more profiles, and Greek mythology is so vast. Here are a few additional figures you can use. Alexander the Great was considered of divine origin. Instead of counting him as a mere mortal, we classify him as a Legend in game terms. We use Prophecy to represent his battle prowess and tactical genius. The ability to use pre-rolled dice represents an opponent who can predict your moves on the battlefield. Here are the game stats for Alexander, his Hypaspists and the Companion cavalry. Other mortal troops suitable for a Macedonian army can be taken from the Greek list. Theseus already appears in the Greek force list, along with his most famous foe, the Minotaur. Earlier in his career, Theseus defeated six other foes on the road to Athens. Here their list by Graeme Davis, the author of Theseus and the Minotaur in the Osprey Adventures Myths and Legends series.